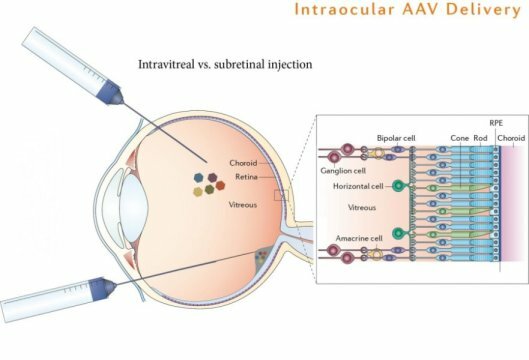 Adeno-associated viruses (AAV) engineered to target specific cells in the retina can be injected directly into the vitreous of the eye to deliver genes more precisely than can be done with wild type AAVs, which have to be injected directly under the retina. UC Berkeley neuroscientists have taken AAVs targeted to ganglion cells, loaded them with a gene for green opsin, and made the normally blind ganglion cells sensitive to light. It was surprisingly simple. University of California, Berkeley, scientists inserted a gene for a green-light receptor into the eyes of blind mice and, a month later, they were navigating around obstacles as easily as mice with no vision problems. They were able to see motion, brightness changes over a thousandfold range and fine detail on an iPad sufficient to distinguish letters. The researchers say that, within as little as three years, the gene therapy -- delivered via an inactivated virus -- could be tried in humans who've lost sight because of retinal degeneration, ideally giving them enough vision to move around and potentially restoring their ability to read or watch video. "You would inject this virus into a person's eye and, a couple months later, they'd be seeing something," said Ehud Isacoff, a UC Berkeley professor of molecular and cell biology and director of the Helen Wills Neuroscience Institute. "With neurodegenerative diseases of the retina, often all people try to do is halt or slow further degeneration. But something that restores an image in a few months -- it is an amazing thing to think about." About 170 million people worldwide live with age-related macular degeneration, which strikes one in 10 people over the age of 55, while 1.7 million people worldwide have the most common form of inherited blindness, retinitis pigmentosa, which typically leaves people blind by the age of 40. "I have friends with no light perception, and their lifestyle is heart-wrenching," said John Flannery, a UC Berkeley professor of molecular and cell biology who is on the School of Optometry faculty. "They have to consider what sighted people take for granted. For example, every time they go to a hotel, each room layout is a little different, and they need somebody to walk them around the room while they build a 3D map in their head. Everyday objects, like a low coffee table, can be a falling hazard. The burden of disease is enormous among people with severe, disabling vision loss, and they may be the first candidates for this kind of therapy." Currently, options for such patients are limited to an electronic eye implant hooked to a video camera that sits on a pair of glasses -- an awkward, invasive and expensive setup that produces an image on the retina that is equivalent, currently, to a few hundred pixels. Normal, sharp vision involves millions of pixels. Correcting the genetic defect responsible for retinal degeneration is not straightforward, either, because there are more than 250 different genetic mutations responsible for retinitis pigmentosa alone. About 90 percent of these kill the retina's photoreceptor cells -- the rods, sensitive to dim light, and the cones, for daylight color perception. But retinal degeneration typically spares other layers of retinal cells, including the bipolar and the retinal ganglion cells, which can remain healthy, though insensitive to light, for decades after people become totally blind. In their trials in mice, the UC Berkeley team succeeded in making 90 percent of ganglion cells light sensitive.